Every month, Loot Crate brings you awesome collectibles & gear you can’t find anywhere else! Take a look at how we bring your loot to life with a behind-the-scenes peek at the Captain Marvel 3D Comic Standee! 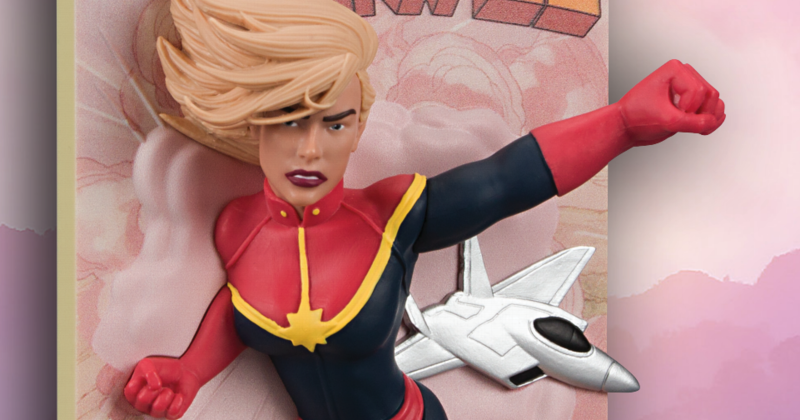 Naturally, we were all really excited about Captain Marvel hitting theaters and we wanted to bring our looters an item that showcased Carol Danvers, both as a superhero and as an incredible pilot. Enter Captain Marvel #5 (2012) with cover art by the legendary Terry & Rachel Dodson! This dynamic cover was begging for the 3D treatment so we started up sketching out a 3D cover. 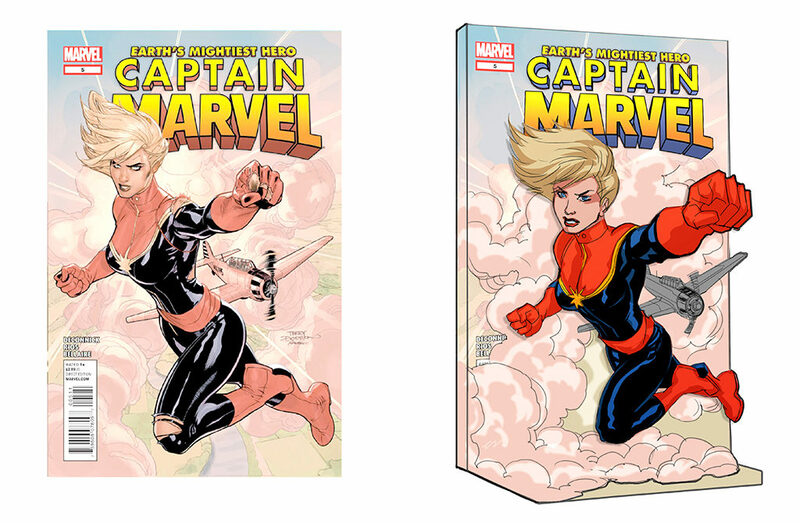 We turned our sketch into a 3D render and our partners at Marvel worked with us to get it just right, even allowing us to pull colors directly from the original cover. As a nod to the new movie, the plane in the background was changed into a modern fighter jet (just like the one Carol flies). After a few more tweaks, our 3D Comic Standee was ready to go higher, further, faster all over your display shelf. We spoke with designer Steed Sun, Loot Crate’s VP of product development (previously featured in Behind the Crate’s interview series!) to get more details into how this item went from concept to reality. Hi Steed! What can you tell us about the original concept behind the 3D comic standee as an item in Loot Crate, versus a more standard type of figure? To start, we didn’t want to do just another action figure or generic collectable. We wanted a unique design which was both figural and focused on the extensive comic art of the Marvel Universe. We explored multiple options, form-factors and designs. Working with the Marvel team, we were able to come up with the final design for all three standee in this series. How did the team go about selecting this particular Captain Marvel comics cover to adapt into 3D form? We went over multiple comic covers with the goal of finding one that would translate best as a 3D comic cover. Since this was a series of three standee, we had to look for multiple covers and made sure that they look cohesive as a set. Also, we needed to make sure that the covers were not too overly complicated as this would not translate well to 3D and would be too costly to manufacture. How long did it take from the selection of the art, to having the first sample in hand, to having a final item ready to ship? The selection of art was relatively quick, only a day or two days but needed full licensor (Marvel) approval before moving forward. Once approved, timing to first sample is about two working weeks. The longest lead time was production timing which took about 4 months from tooling to final finished product ready to ship. What are the most challenging aspects of adapting another artists’ work and rendering it into a physical item with depth and dimensions? The most challenging part of this design was translating a 2D image to a 3D physical part. We have to account for perspective, proportions and any foreshortening to make the 3D part look correct. We went through 3 or 4 rounds of revising the digital sculpt in order to get a final, approved sculpt before moving into full production and manufacturing. If you missed out on our COSMIC crate featuring this Captain Marvel standee, never fear – we have one more Marvel comics tribute coming soon. Get the SHOWDOWN crate while supplies last! Previous article Tuesday Trivia: Avengers Part Two! Behind the Crate: Spotlight on Loot Crate's Anime Fans! Behind the Crate: Interview with Copywriter Natalie Hazen! Exclusive: Our Interview With 'Lord of the Rings' Composer Howard Shore! Behind the Crate: Spotlight on Loot Crate’s Anime Fans! Exclusive: Our Interview With ‘Lord of the Rings’ Composer Howard Shore! Exclusive: Interview with Instructor Ben Tristem of GameDev.tv! Loot Wear: ‘For Her by Her’ with Asunción Macián Ruiz + Loot for Her Reveal (SPOILERS)!